Looking for a simple and cost effective way to save energy by turning off the lights when no-one's in the room? The new Leviton IPSD6-1LZ is a dimming occupancy sensor, compatible with new LED and CFL lights as well as traditional incandescent lighting (see ratings below). 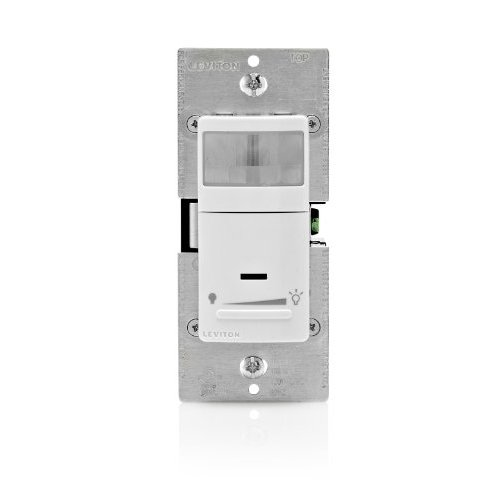 This occupancy sensing dimmer does NOT require a neutral wire connection so can be used in new and retrofit applications. It simply replaces a standard wall switch, fitting in to a standard decora style plate. A built-in ambient light override makes sure lights won't be turned on when there is already enough light in the room. The ambient light level is adjustable. 'Manual On' mode can be enabled by adjusting ambient light level to 'zero' position.